In this episode I talk about a couple OneNote settings, a way to join MP4 files, the importance of Windows Updates, and a bonus tip for how to use your Push2TV device. Past episodes of YDKWYDK are online right here. 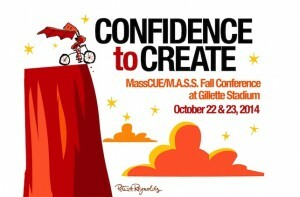 On Wednesday, 10/22, MattieByrd McHold and I headed out to Gillette Stadium for the Massachusetts Computer Using Educator’s 2014 Confidence to Create conference. 1) MassCUE knows how to run events. The whole environment was super well organized and had a very positive, fun vibe. 2) We absolutely need to get a Makerbot 3D printer here at Williston. The applications are phenomenal across many disciplines as are the ways they can transform a class. 3) I want to try using Minecraft in my classes. I saw some great ways it could be used in Algebra 2 and have some theories about projects I could run using the system in my Multivariable Calculus classes. 4) Librarians should run the world. 5) I need to encourage more play in my classes. 6) The #MassCUE2014 hashtag is a great way to get LOTS of info on the conference. Our journey started with a smooth drive through the rain which was nicely devoid of any traffic, which seemed weird since we were heading to a massive stadium. Registration was easy, even though we both had to get our materials reprinted. Up a few sets of escalators we found ourselves in the heart of the stadium surrounded by an incredibly long column of edtech vendors. For the first time of many, we checked the map and decided to go catch the second half of the keynote speaker, Steve Gross. Our walk took us outside between the East and West sections of the stadium, which gave us a great view of the field! Steve Gross’ presentation on the importance of play was very smooth, optimistically animated, and well worth attending. I’d love to see his Life is Good Kids Foundation in action. Next we headed down to the student showcase are where we saw a really strong presentation on 3D printing in the robotics classroom. The HS presenters were poised and excited to share what they had learned and built. We then made the fun walk over to another area where we sat in on the second half of a presentation covering how to use Minecraft in the classroom. The immediate applications are super fun to consider. The speaker was engaging and gave a great overview of the ways the system could be used in many different areas, from history to mathematics to design. Next, we stopped by and saw a presentation by a MS librarian, Laura Gardner (@LibratianMsG), on how to leverage social media in libraries. She had some great ways to promote the library and reading in general! MattieByrd and I then enjoyed a very nice lunch, which was preceded by an unexpected surprise on our walk to the dining area, a view (from a distance) of the Patriots practicing! We left the conference energized and excited to continue our edtech work at Williston!